The most recent translation of The Spirits’ Book has been released. 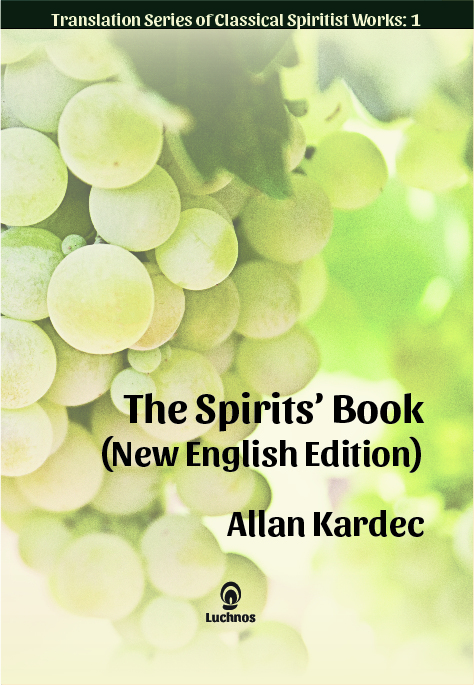 This new translation is based on painstaking research of the French text, so as to provide the most faithful rendering in English of Kardec’s seminal work. Several original editions in French were analyzed, comparing all the changes that Kardec himself made to the text, with copious notes that allow any reader to reconcile the translation with the source text in French. This translation also carefully analyzes the nuances in meaning and usage of vocabulary (in both French and English), as well as different stylistic choices that must be made in English, striking a balance between literal accuracy and readability. The Spirits’ Book represents a philosophical guide for real people, encompassing the analysis of all the fundamental questions underpinning human existence. According to Socrates, “the unexamined life is not worth living.” In this sense, The Spirits’ Book may very well be one of the most worthwhile companions you will ever have in your life. Just got my copy today. It is awesome. Will you be doing the other books of the codification in modern English and in hardcover format? We’re glad you liked this new edition! Yes, we will publish new English translations of Kardec’s five main books. Every title will be available on both paperback and hardcover editions (and Kindle). Previous Previous post: How to translate the word “Spiritism” into Chinese?